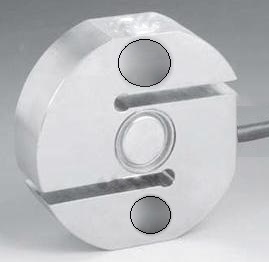 Description : This is Strain Gage based Round S Beam Load Cell for tension measurement. It is fully temperature compensated from 0 to 60 Deg.C. It can be used to manufacture the axle weigh bridge for truck load verification on road. Features : Its round and slim shape makes it very suitable for axle weigh pad application. It is loaded through round pins to make it insensitive to impact loads associated with weigh pad application. Electronic Instrumentation / Software : It can be supplied with digital indicator , controller , serial interface module for computer interface and user software for tabulation , analysis and graphics. Mounting Hardware : Optional mounting hardware can be supplied upon request. Vadodara - 390 010. Gujarat, India. Copyright © 2012 ADI ARTECH TRANSDUCERS PVT. LTD. All rights reserved.